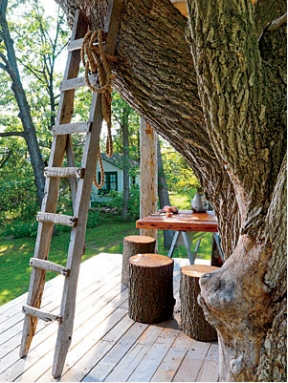 Look at this amazing tree house! This sure is an impressive improvement on the youthful fantasy of a secret hideout. It’s part of Camp Wandawega–this awesomely renovated old Latvian summer camp in Wisconsin. You can stay there and enjoy 25 acres with canoes, fire pits, and history (though they suggest “modest expectations” of “camping indoors”). Hopefully they’ll be taking reservations for the treehouse soon. And it sounds like this would be a nice weekend to be in Wisconsin (or somewhere other than the Eastern seaboard). Stay safe and have a good time!